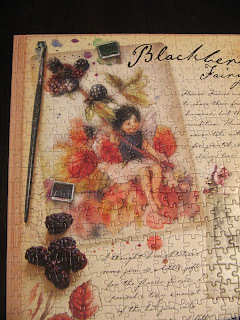 madly off in all directions: Did You Think I'd Gone For Good? Did You Think I'd Gone For Good? Yes, yes, I'm still here. I've just been busy with mostly unblogable things. I spent the two or three weeks before his stay cleaning the house from top to bottom - well, actually I never got to the basement level, it's still a bit of a tip. Ian suffers from allergies which were very serious when he was a child, so I felt compelled to clean thoroughly - considering the two dogs, the rabbit and the general dustiness of the old place. I was quite worried he'd drop dead the minute he walked through the front door, but he didn't, Hoorah! He even managed a stay of five days without one trip to the hospital, though there was one trip to the pharmacy for antihistamines. 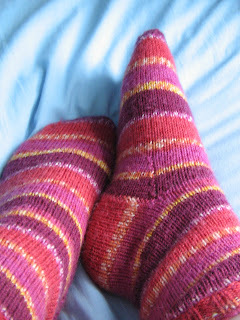 In the knitting department, I did finish those socks I started ages back. They were a very quick knit and I've been meaning to show them, it just kept slipping my mind. They're very cheerful. They remind me a bit of the jars of jelly my Mother makes. Raspberry, bramble berry, red currant all cooling on a sunny windowsill. Very berry, jewel tones. I've also been working on a tot cardi for a little one I know. 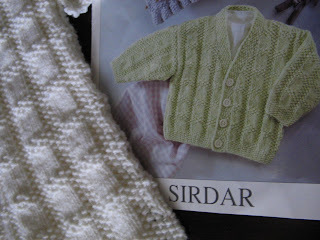 It's being worked in the recommended yarn, Sirdar Baby Care DK in a lovely fresh cream colour. I've finished the back, both fronts and both sleeves. I'll start sewing it up and then work the button band. I also need to choose some buttons - a favourite chore of mine. There's also been two other projects in the works, one of which is winging it's way to its new home as we speak, and the other is queueing up to fly. As soon as they reach their destinations, I'll show you some photos. First to comment. Yeaaaa! Just want to say I had a lovely visit to Winnipeg. The weather was warm (if a bit dusty) and the hospitality was amazing (thanks Annie, Nigel, Elly, Ian, Gus and Whimsy)! Lots of chocolate, wine, Blackadder, whisky and... dog slobber. Now that's a holiday! I was just thinking we didn't take a single photo. Oops! Anyways, it was great fun. It was also a personal victory for me to stay for five days in a house full of animals (I mean, of course, the dogs and the rabbit!) without expiring. Thanks again for a fantastic time. If you're talking about my parcel than it arrived today(april 23 well planned! )I've been very tempted to open it,and the card from Granny and Grandpa which came yesterday.